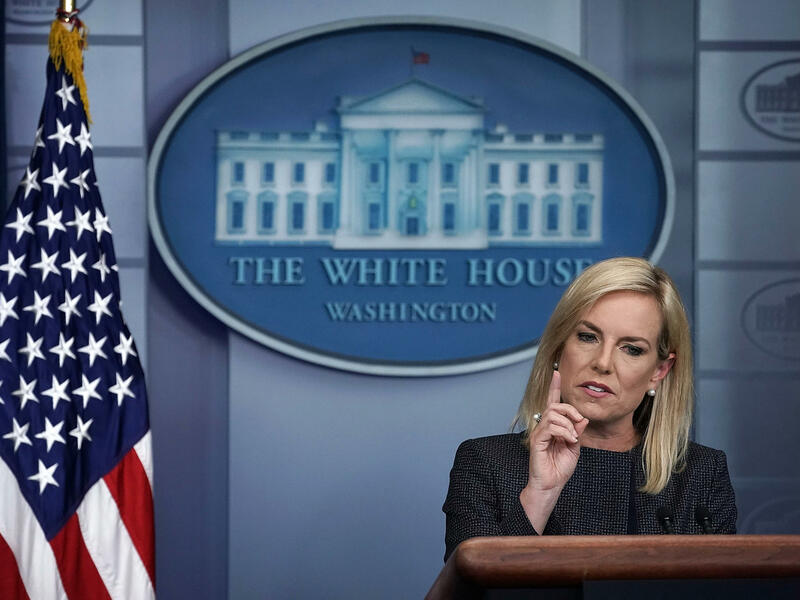 Homeland Security Secretary Kirstjen Nielsen speaks Monday during a White House news briefing about children being separated from their parents who enter the U.S. illegally. On Monday, reporters relentlessly confronted Homeland Security Secretary Kirstjen Nielsen at a news conference held at the White House. They grilled her on the government's policy of separating young children from parents seeking asylum after crossing the U.S. border with Mexico. CNN's Jeff Zeleny asked why that did not constitute child abuse. A second reporter questioned where girls were, noting that photos released by the government largely featured boys. A third reporter challenged President Trump's compassion, noting his tweets indicated concern for almost anyone other than the families. "Those who criticize the enforcement of our laws have offered only one countermeasure: open borders, the quick release of all illegal alien families and the decision not to enforce our laws," Nielsen said from the White House lectern. "This policy would be disastrous." To be clear: The claim there's only the Trump way or anarchy doesn't have much currency outside the administration and its allies in conservative media. Nor does the idea Trump couldn't have acted until Congress changed the law. For days, Trump's fellow Republicans in Congress have said he could erase the practice — one put in place under his presidency — with a wave of the hand. Many of them publicly called upon him to do so. Back on Monday, Trump's homeland security secretary embarked on a series of insupportable assertions, none more fundamental than this: "It's not a policy." But it was. Nielsen herself had said there needed to be a break in how Presidents Barack Obama and George W. Bush processed people coming across the border. If an intentional shift in the way the government handles people seeking asylum does not constitute a policy, what meaning does the word "policy" have? I report about the media for NPR and in so doing, I periodically cover NPR and its policies. I don't speak for the network. I would say the word "lie" fits here. Back in May, White House chief of staff John Kelly spoke with NPR's John Burnett in an interview that made headlines around the world. Kelly told Burnett that the laws against people entering the country without legal status had to be enforced. Kelly, who is Nielsen's predecessor at Homeland Security and her mentor, said much the same to CNN when considering the policy back in early 2017. So did U.S. Attorney General Jeff Sessions on Fox News Monday night. So why would Nielsen seek to deceive the public? Cast your mind back to the first week of Trump's presidency, with spurious claims from the president and his press secretary about record crowds at the inauguration. Trump has issued more than 3,250 false or misleading claims in his first 497 days in office, according to an account by The Washington Post's Fact Checker column in late May. The paper quoted a psychology researcher from the University of California, Santa Barbara who said Trump's repetition of falsehoods gave them greater credence among his core supporters. That impulse emerged again on Friday. Trump spoke to a clutch of reporters surrounding him on the White House lawn as he strolled to pop on his favorite morning TV news show, Fox & Friends, which was helpfully camped out on the grounds. Trump deflected questions about the false claims his lawyers made last year on his behalf. The attorneys had denied — untruthfully — that Trump had anything to do with his son Don Jr.'s statements about the purpose of his meeting with Russians during the 2016 campaign. "It's irrelevant," President Trump said. "It's a statement to The New York Times, the phony, failing New York Times." Don Jr.'s statements turned out to be untrue. So were the denials of the president's involvement, who, it turned out, dictated his son's response to the Times. The president made clear he didn't care about the deception. "Wait a minute, wait a minute," he said. "That's not a statement to a high tribunal of judges. That's a statement to the phony New York Times." It's OK, apparently, to deceive the public as long as it's through the nation's leading newspaper. That's what you might well call a double deception — a lie about a lie. But what you call it almost doesn't matter. More important is that the media and the public register a fundamental fact: Top people speaking for the United States aren't telling us the truth — starting with the president. As we've been saying, President Trump has reversed himself, signing an executive order that ends the separation of families at the border. That may quell some of the outrage over his policy, but as NPR's David Folkenflik argues, it's not likely to quell questions about whether White House officials are telling the truth. DAVID FOLKENFLIK, BYLINE: This isn't about spin or splitting hairs or differing opinions. This is a reality check about our expectations of the people who act in our name. On Monday, Homeland Security Secretary Kirstjen Nielsen held a press conference. The White House press corps was relentless. UNIDENTIFIED PERSON #1: How is this not specifically child abuse? FOLKENFLIK: Nielsen didn't back down. KIRSTJEN NIELSEN: Those who criticize the enforcement of our laws have offered only one countermeasure - open borders. FOLKENFLIK: The idea there's only the Trump way or anarchy doesn't have much currency outside the administration and its allies in conservative media. President Trump's fellow Republicans in Congress have said for days he could change the policy (snapping) like that. The president today says he's done so. Back on Monday, his Homeland secretary embarked on a series of insupportable assertions. NIELSEN: It's not a policy. FOLKENFLIK: Yeah, that is a policy. Nielsen herself said there needed to be a break in how presidents Obama and George W. Bush handled people coming across the border. If an intentional shift in how to deal with people seeking asylum is not a policy, what meaning does the word policy have? Then, there was this. UNIDENTIFIED PERSON #2: Are you intending for this to play out as it is playing out? Are you intending for parents to be separated from their children? Are you intending to send a message? NIELSEN: I find that offensive. No, because why would I ever create a policy that purposely does that? UNIDENTIFIED PERSON #2: Perhaps it's deterrence. FOLKENFLIK: Call it a deception, an evasion, a technical nicety. NPR will not call it a lie because it cannot gauge Nielsen's intent. I don't speak for the network. I'd say the word lie fits. Regardless, NPR and other news organizations say Nielsen was dead wrong, that there clearly was a policy. Here's White House chief of staff John Kelly back in May talking with NPR's John Burnett in an interview that made headlines around the world. JOHN BURNETT, BYLINE: So family separation stands as a pretty tough deterrent. KELLY: Could be tough deterrent. Would be a tough deterrent. FOLKENFLIK: Kelly said the same to CNN when considering the policy back in early 2017. So did U.S. Attorney General Jeff Sessions Monday night on Fox News. So why would Secretary Nielsen seek to deceive the public about that? The tone comes from the top, set that first weekend of Trump's presidency with spurious claims of record crowds at his inauguration. It emerged again on Friday. UNIDENTIFIED PERSON #3: But can you tell us? PRESIDENT DONALD TRUMP: It's irrelevant. It's a statement to The New York Times - the phony, failing New York Times. FOLKENFLIK: Trump was speaking to a clutch of reporters on the White House lawn. He was justifying untrue claims from his lawyers last year, denying that Trump had anything to do with his son Don Jr.'s statements about meeting with Russians during the 2016 campaign. Don Jr.'s statement turned out to be untrue. So were the denials of the president's involvement. Trump doesn't care. TRUMP: Wait a minute. Wait a minute. UNIDENTIFIED PERSON #3: To clear it up. TRUMP: That's not a statement to a high tribunal of judges. That's a statement to the phony New York Times. FOLKENFLIK: So that's what you might well call a double deception - a lie about a lie. I sure would. But what you call it almost doesn't matter. It's that the media and the public register a fundamental fact. Top people speaking for the United States aren't telling the truth, starting with the president. I'm David Folkenflik. Transcript provided by NPR, Copyright NPR.